Ten teenagers have been arrested after 337 windows were smashed on a number of trains, including one that featured in the Harry Potter films. The trains were all housed at the West Coast Railway Company depot in Carnforth, Lancashire. The damage, which is expected to cost about £75,000 to repair, happened on 11 March, British Transport police said. The youths, aged between 12 and 14 years, from Carnforth and nearby areas, were released on police bail until May. 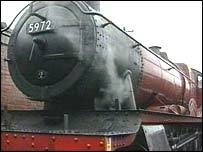 The 'Hogwarts Express' train used in the Harry Potter films is one of a number of trains that are stored at Carnforth. The nearby station also featured in the 1945 film Brief Encounter.